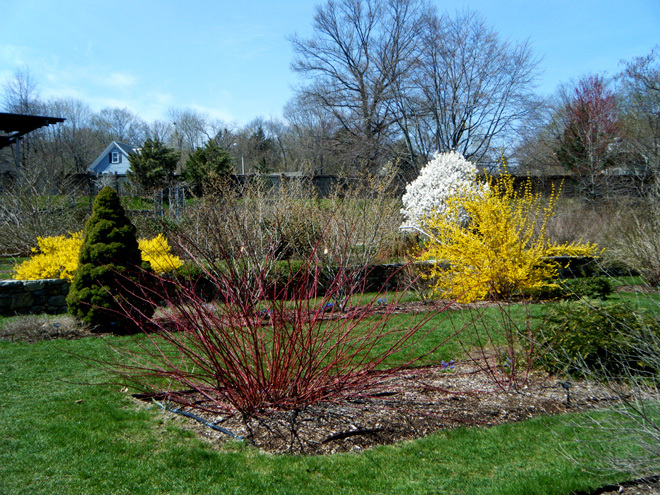 Winter may not have been kind to Boston this year, but spring is finally arriving and can be enjoyed most at the Arnold Arboretum. You can see signs of it in the yellow buds dotting the hillsides of the park, in the purple lilacs that have opened up, in the kids pedaling around the park’s trails, and dogs splashing through its streams. For over a century the Arnold Arboretum has been providing Bostonians with a quiet oasis just a subway-ride away from the hustle and bustle of downtown life. Founded in 1872 as the nation’s first combined public garden and center for botany research, the arboretum is the perfect amalgam of recreational and educational opportunities. Its 265 acres feature over 15,000 plants, each of which bear non-invasive labels for easy identification. But the real draw of this public tree garden is the space it gives to city dwellers: space to run, walk, bike, or have a picnic, benches to lounge on, and open sky to look at up at. The mission of the Arnold Arboretum is “to foster greater understanding, appreciation, and stewardship of the Earth’s botanical diversity and its essential value to humankind.” To this end, a host of classes are offered year-round for children and adults. The adult courses range from photography and painting to tips on gardening and tree identification while elementary and preschool classes can enjoy field studies. 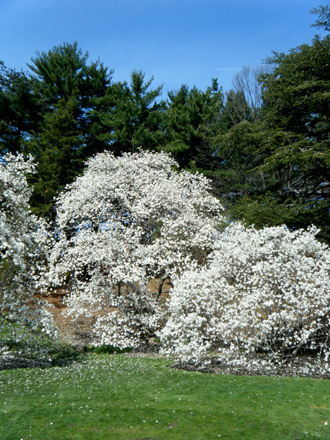 The arboretum even has paid research internships for college students studying botany, horticulture, and landscape design. For those inclined toward self-education, the Hunnewell Visitor Center has a small, child-friendly museum with interactive displays and a horticultural library open to the public but used primarily by Earth scientists for research. To get to the park, it’s an easy five-minute walk up Arborway from Forest Hills stop on the orange line of the MBTA. If it’s your first time in the park, you might want to take Meadow Road to the Hunnewell Visitor Center for a $1 map. Along the way, you can take in the magenta buds of the azaleas. Outside the visitor center, feel free to stop and admire the lush white flowers of the magnolia trees before crossing over to Bussey Hill Road via Linden Path. It emerges at the Leventritt Shrub and Vine Garden, where you can rest under the open-air pavilion and check out the bonsai house. The garden has the feel of a sanctuary, as if everything had been planted to create a perfect aesthetic balance. Sanctuary, actually, is a word to describe the feel of the entire arboretum, as everywhere you walk it’s just you and the trees and people enjoying nature. As I passed Bussey Hill, I couldn’t resist my map’s promise of dogwoods, so I strolled up to the top. In addition to the pink and white of the just-budding dogwoods, I found a smooth square of shaded grass: the perfect place to stop for a quiet lunch, read a book on one of the stone benches, or admire the forsythia that bloom bright yellow flowers along the steps up the hill. At 200 feet above sea level, Bussey Hill is the second highest point in the Arnold Arboretum, and from it, I was surprised to see a peek of Boston’s downtown skyline. I was impressed and even more curious to see it from atop Peters Hill, which at 240 feet, is the highest point in the arboretum and the second highest in all of Boston. Hemlock Hill Road connects Bussey and Peters Hills, but is worth a stroll for its own sake. The towering hemlocks with blue-green needles alongside Bussey Brook make for optimal picture taking. It took over an hour of leisurely walking to reach Peters Hill and my feet were starting to protest. I hoped the view would be worth it. 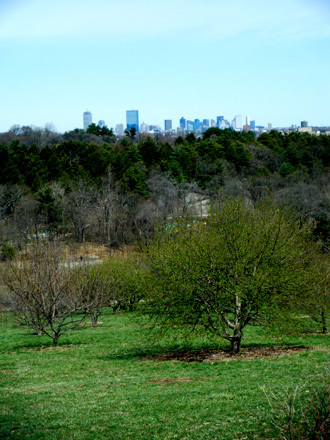 Reaching the top, above the cherry trees, there it was—an unobstructed view of the whole arboretum and of the Boston skyline. Looking at the beauty, I wanted to come back a few weeks later, when spring was in full swing, to see everything in bloom. I wanted to come back in summer, when the hillsides would be speckled with picnickers. I wanted to come back in fall, when the trees would be changing colors, and I wanted to come back even in the winter to see it all clothed in snow. Every day dawn to dusk.